There is a place on the Internet where any movie can be instantly streamed in perfect high-definition quality. Like a Netflix that actually has the selection you want, it's filled with all the movies you don't want to spend $12 to see in theaters but would happily watch for free from the comfort of your couch. It's called Popcorn Time, and it's making illegal online piracy scary simple. The downloadable app for Windows, Mac and Linux -- that launched about a month ago but is recently gaining steam -- works with BitTorrent to let users download movies from the Web completely free. An impressively sized selection means users can watch this year's Oscar-winning films or the movies still in theaters -- selections that might never make it to their Netflix accounts. But the genius of Popcorn Time is that it's so easy to use that people might not even realize what they're doing is illegal. So many choices. So simple. So illegal. The app eliminates the need to navigate through confusing torrent sites and has made stealing copyrighted material easier than ever. This is no sketchy web equivalent of a back alley, either; it's a smooth, beautifully designed site that's arguably easier to navigate than Netflix or HBOGo. However, watching a movie through Popcorn Time is stealing copyrighted material, and there's always the possibility of jail time, felony charges and a $250,000 fine. Online piracy's effects on the entertainment industry have been much debated, with the controversial SOPA and PIPA acts making headlines last year and some recent studies suggesting that piracy actually benefits creative industries. But while Popcorn Time's creators reportedly aren't worried about getting into trouble -- no copyrighted material is hosted on their site, and the service is free and open source so they're not actually doing anything illegal -- users should exercise some restraint. The US Copyright Group has managed to track down individual file sharers before, so unless you're using a virtual private network, you're at risk should you choose to download movies from Popcorn Time. Moral of the story: Those opposed to the possibility of spending time behind bars may want to stick to renting DVDs. 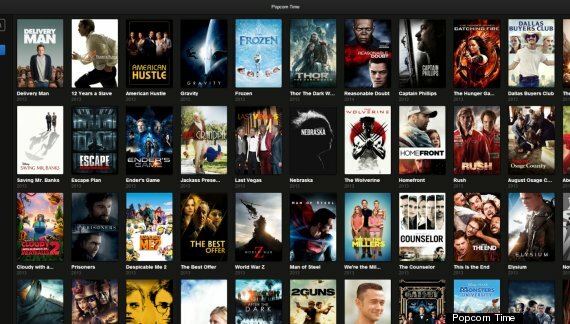 Popcorn Time is shutting down today. Not because we ran out of energy, commitment, focus or allies. But because we need to move on with our lives. Our experiment has put us at the doors of endless debates about piracy and copyright, legal threats and the shady machinery that makes us feel in danger for doing what we love. And that’s not a battle we want a place in.